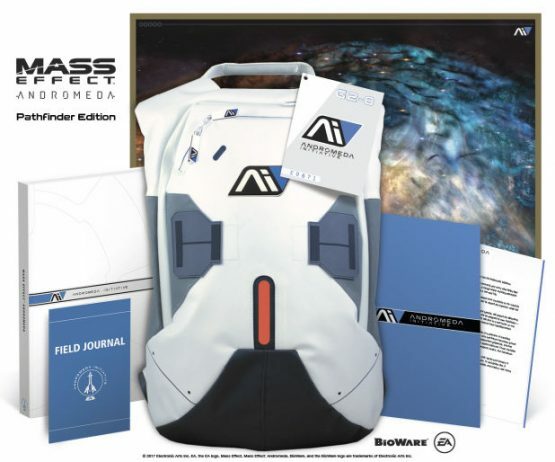 Folks over at Prima Games have offered us a sneak peek into their official Mass Effect Andromeda strategy guides, which come in three versions: Standard, Collector’s Edition, The Pathfinder Edition. While the Standard version is self-explanatory, the Collector’s Edition comes with a premium hard cover and multiplayer booster pack DLC, which includes weapons and equipment. It also features bonus content including developer interviews, and a foreword by BioWare’s Lead Designer, Ian Frazier. The Pathfinder Edition comes with exclusive collectibles: a Mass Effect Andromeda Initiative backpack, a welcome letter, multiplayer booster pack DLC, a galaxy chart, a field journal, and a branded envelope. The Pathfinder Edition also comes with its own distinct hard cover. Prices of each will depend on your choice of retailer but do note that the Pathfinder Edition is limited in quantity. If you want to pre-order one (or any of the other guides), then make sure to follow the link below where you’ll also find more details on the aforementioned collectibles. Are any of our readers planning to pick one up?